Omega Xl - DONT BELIEVE THE HYPE!!!!!!! Celebrities are all about making money even if it requires them to lie!!!!!!!!!!!! Jun 26, 2015 Thank you for taking the time to communicate to us. We handle hundreds of thousands of calls a month and, like many companies, we experience heightened call volumes at certain peak times. We maintain an A rating with the Better Business Bureau and take pride in our customer service. We have thousands of satisfied customers and request that you contact our Customer Advocacy Department at 1-800-607-0419 ext. 3188 to address your concerns. Thank you again for your feedback and we look forward to hearing from you. I was laying in bed when the infamous commercial or shall I say people of God endorsing junk. If anyone has paid any attention to the fact that all but one person is sitting and really not doing much moving in those seats. But again they had dancers in the back ground that really had nothing to do with the omega xl, but we we're suppose to believe that it really works. I a skeptic about everything so it's hard to get me to buy anything and majority of the time I don't even purchase medicine prescribed by my own doctor. Just so everyone will know I have real bad lower back pain, last year I suffered from a real bad cough and could nearly breath on top of that after I would eat I would start coughing and choking real bad to the point that I had fractured a rib, not to mention of other pains in my body. Thanks for reading. God Bless!!!!!!! Review #533154 is a subjective opinion of User533154. 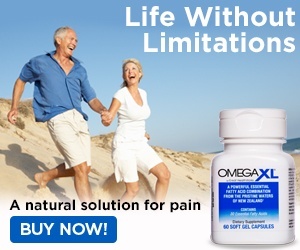 Wow that's crazy because I'm watching the omegaXL commercial right now. I suffer. From rheumatoid arthritis and I'm in pain everyday, especially in my knees so it's hard to walk.or even bend over. So I think it sad to get people's hope up knowing that the world is In a great deal of pain and just want relief.